DALI (the name is actually an acronym for Danish Audiophile Loudspeaker Industries) debuted its new IKON range at the May 2010 Munich High End Society show and while the overall sizes and configurations of the various MK2 models do correspond closely to those of the original IKON range (first launched in 2005), they also incorporate plenty of engineering and cosmetic changes. The IKONs are Danish-made loudspeakers, so manufacturing isn't cheap. Furthermore, the value of the Danish Krone (linked to the Euro) has appreciated significantly compared to sterling in recent years, so a significant price rise for this MK2 range was inevitable. Even so, an increase from £999 to £1,699 over a six-year span is pretty hefty, especially for a speaker finished in vinyl woodprint. While the IKON 7 MK2 might, therefore, seem to be rather less of an obvious bargain as its predecessor, it's still a lot of hi-tech speaker at a decent enough price. Speakers made in China certainly appear to offer rather more for rather less and customers who shy away from vinyl woodprint might not be won over, but the combination of advanced drive units and European manufacture are arguably benefits that justify the price premium. The new IKON range consists of five stereo pairs, alongside three extras oriented towards multichannel duties. This IKON 7 is the largest in the line-up and is a tall, quite deep and substantially built floorstander, though fashionably slim in the modern idiom. Our samples were dressed in black woodprint vinyl covering the back, top, sides and base, while the extra-thick front panel is plain mattblack. The net result is a rather dour and monolithic appearance. A 'light walnut' woodprint over five faces is also available, though that is the only alternative option. The entire enclosure is stiffened by carefully positioned internal bracing, while the front panel is constructed from two substantial layers of MDF, bonded by a glue that provides a measure of damping. Since the enclosure is quite narrow, alloy outrigger feet are supplied and fulfil the two functions of improving the physical overall stability and ensuring proper spike-fixing. Not that there's anything wrong with out-sourcing drive units from experienced OEM manufacturers, as is relatively common practice amongst the smaller brands, but one important feature that distinguishes DALI from many competitors is that it uses its own proprietary drive units. The IKON 7's front panel has an impressive array of five drivers, topped by DALI's exclusive 'Hybrid Tweeter Module' (HTM), which is featured in all the IKONs (bar the subwoofer). It's a combination of a conventional 28mm fabric-dome tweeter that starts operating around 2.5kHz, plus a 17x45mm ribbon unit that starts coming in at around 14kHz, maintaining wide lateral dispersion well beyond audibility. Both are mounted on the same chassis/faceplate. The bass and the midrange are handled by three apparently identical 165mm cast-frame units, with dish-shaped diaphragms made from a reddish-brown mix of wood fibres and paper pulp, 115mm in diameter. The lower two only operate through the bass region, rolling off above 700Hz, while the uppermost one handles both bass and midrange duties, right up to the main 2.5kHz crossover, where it hands over to the HTM. The driver line-up looks just like its predecessor from the outside and only the change in baffle colour from silver to black really provides a visual clue to the new MK2s. In fact, a lot of development work has gone on under the surface, resulting in numerous detail changes to most of the 'invisible' parts of many of the components. A design target was to 'warm up' the tonal balance in order to deliver a 'richer, warmer sound', to which end the main drivers have been significantly revised, particularly to optimise airflow – rather successfully it would seem from our measurements. It's not possible to estimate just how much improvement DALI has wrought when taking the IKON 7 to MK2 status, but there's no denying it's a thoroughly impressive performer that remains very competitive, even at its new and significantly higher price. The enclosure engineering seems particularly good here, in that there's very little evidence of it making unwanted contributions that add colorations and muddy up the sound. The result is superior freedom from boxiness and a very low 'noise floor', giving a wide overall dynamic range, even though dynamic expression itself is unexceptional. The tonal balance that we mentioned earlier is also an improvement on its rather dry-sounding predecessor and that has certainly been achieved. The bass end here could, perhaps, go deeper, but it's generally full and reasonably even with it, bringing a welcome warmth to the overall character. 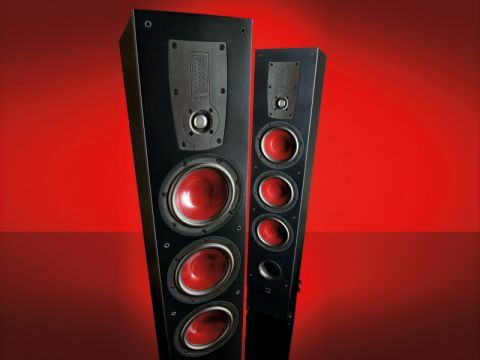 One might wish for a little more grip and power, of the sort one occasionally finds amongst genuine high-end speakers. But the bass end of the IKON 7 is as good or better than any of its immediate competition, bringing the requisite richness to the proceedings and acting as an appropriate foil to the sweet and open top end. The twin tweeter arrangement seems to work very well indeed. It's certainly smooth and well extended, without ever drawing unwanted attention to itself and presumably contributes to the fine transparency and precise stereo imaging that this speaker delivers. The midband might not be the smoothest around, but it's expressive and involving and doesn't seem to add significant coloration either. Perhaps the most important feature of the IKON 7 MK2 might well be its overall top-to-bottom coherence. While this doesn't perhaps, quite match that achieved by those speakers that use a solitary 'full-range' driver (the inverted commas are quite deliberate, as 'full-range' is invariably optimistic), it does, nevertheless, possess fine overall timing across the whole audible frequency range. Wind the volume up high and there is a mild tendency to emphasise the extreme top and bottom frequencies at the expense of the midband. But at most normal listening levels the speaker sounds 'just right'. This is an unavoidable consequence of the way human hearing works: at low sound levels it shows greater relative midband sensitivity than when perceiving much louder sounds. We're getting into a very complex area of psychoacoustics here, the simplified upshot being that the speaker designer has to make choices that are related to personal preferences. While it's not exactly a game-breaker, this is a speaker that marginally favours low and medium listening levels. The IKON 7 MK2 might not be the most attractive-looking speaker around, but it does unquestionably deliver the sound-quality goods. It's not a high-end model, but it does offer a substantial percentage of high-end performance at a far more realistic price.